This entry was posted in 2016 Corel Painter Posts, Skip Allen & Painter 12 and tagged Corel Painter 2016, Live Webinar, Skip Allen. Bookmark the permalink. Tuned in late but got a lot out of the webinar. You do a great job. Have you or will you do a tutorial on how you make new of your new brushes like wetting agent. I will be getting 2016 since I have held off for several version I’m on 2012 version but love the new brush engine. Thank you very much. It was really a hodge podge…LOL. Nothing was really planned and those can sometimes be the most fun. Glad you are upgrading to 2016, you will love it. Your tutorials are always edifying and simple to grasp. You always leave us with nuggets of practical knowledge about Corel Painter. Thanks for being the most inspirational tutor online. We truly treasure the gems you so willingly share. Truly magnanimous of you. You are too kind. But I think you for your lovely comment. You have made my day. Thank you for taking the time to comment. I really appreciate you taking my class, too. I’m glad you like the blue heron. I’m getting a lot of comments on it. Thank you very much, Elaina. I am hearing from so many folks that I respect about how much they like that painting…even as is. It is hard for me to paint that way; it is too slow and methodical. I want the experience to be spontaneous. But, like you said, this style shows the incredible versatility of Painter. I kept trying to figure out what the background was supposed to be and I couldn’t. I think that is why I stopped. I actually have a bunch of paintings that I consider not finished that haven’t seen the light of day. 🙂 Maybe I need to rethink my position on them. Thanks again for taking the time to comment and for your insight. Loved the webinar – never worry about going over in time, as your humble audience LOVES that!!!!! Thank you Skip for your generous heart and nature. It is always good to hear from you. I love and respect your work bunches. Great webinar Skip thank you so much! Congratulations on your success! 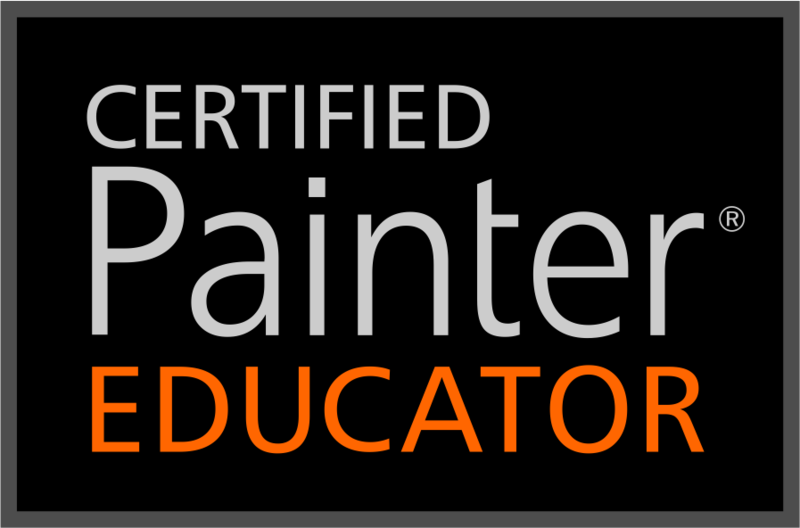 And we are all signed up for “New Horizons,” Corel Painter 2016 DAA class! Hugs. Thank you Kari…we are going to have a blast. Congratulations skip, can’t wait for your class and the recordings of the sessions too! Thank you so much. I hope to post them, today. Yes, I will show that technique in more detail.